Several years ago, I switched from taking the Brown Line to the Blue Line to get to work. Initially it was because of the Brown Line renovation, and my commute time was expected to double. So my choices were: get up earlier (not likely) or find an alternate route. Because the Blue is so much faster, I still take it to work. Often I drive to the nearest station and park near the Cooney Funeral Home. But sometimes I have my act together enough to take the bus. Surprisingly, I can take two buses and the Blue Line and still get to work faster than if I just walked to the Kedzie Brown Line and rode it all the way in. 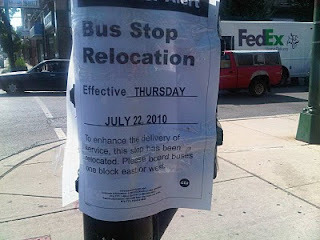 However, there is something that has always bother me about the Irving Park bus ride. We stop at Central Park and then we make another stop one block later at Elston. It seems to me that it would make more sense to eliminate the Central Park stop and make everyone walk one short block -- and it really is a short block -- east or west to catch the next bus. Spotted this sign as I walked home today. Looks like they are getting rid of the stop. My only questions are 1) why make it happen on a Thursday and 2) who in the CTA is reading my mind.